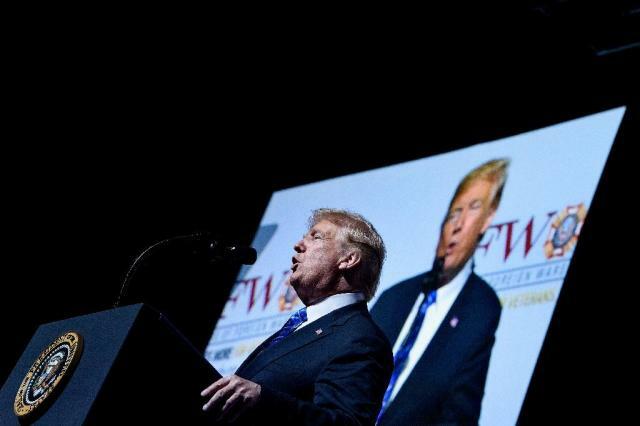 Kansas City (AFP) - US President Donald Trump welcomed Tuesday reports that North Korea has started dismantling facilities at its main satellite launch station, which is seen as a testing ground for intercontinental ballistic missiles. New satellite imagery shows "that North Korea has begun the process of dismantling a key missile site, and we appreciate that," Trump said during a veterans event in Kansas City, Missouri. "We had a fantastic meeting with Chairman Kim and it seems to be going very well," Trump added, referring to his summit last month with North Korean leader Kim Jong Un. Secretary of State Mike Pompeo said the imagery was "entirely consistent" with commitments Kim made to Trump during their summit in Singapore. "We've been pressing for there to be inspectors on the ground when that engine test facility is dismantled consistent with Chairman Kim's commitment," Pompeo said at a news conference in California. "They need to completely denuclearize, that's the steps that Chairman Kim committed to and that the world has demanded," Pompeo added. Trump once again praised his rapport with strongman Kim, with whom he said he had a "good relationship, good feeling" and said that the question of repatriating the remains of US troops killed during the Korean War would be addressed soon. We are "working to bring back the remains of your brothers-in-arms who gave their lives to Korea," Trump said in an address to the Veterans of Foreign Wars group. "I hope that very soon these fallen warriors will begin coming home to lay at rest in American soil." On June 20, Trump erroneously said 200 human remains had already "been sent back" from North Korea but the issue is far from resolved and North Korea has already canceled at least one meeting to discuss the return of the remains.